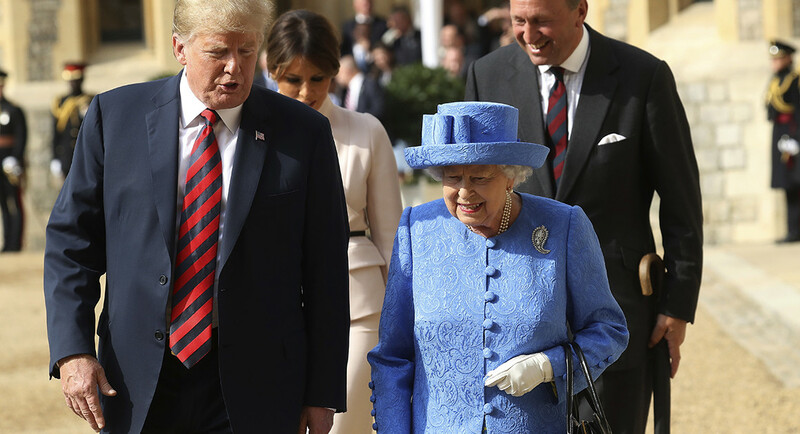 The visit comes during Trump’s tumultuous swing through Europe, in which he alienated NATO allies, sharply criticized British Prime Minister Theresa May and said his upcoming meeting with Russian President Vladimir Putin might be the “easiest” of his trip. The president flanked the queen to her left, with Melania Trump to her right. They are scheduled to have tea, and the televised portion of their meeting did not include broadcast comments. Each of the 12 presidents in office during the queen’s 66-year reign except President Lyndon B. Johnson have met with her. “I really look forward to meeting her. I think she represents her country so well,” he said in the interview. “You don’t see, like, anything embarrassing. She is just an incredible woman,” he said of the queen. Trump’s visit also comes amid protests in London, which included a balloon of a giant baby Trump flying over the Houses of Parliament. Published on Fri, 13 Jul 2018 17:29:00 GMT, © All rights reserved by the publisher.